A double-sided T-shirt quilt is two quilts in one, because your T-shirts are on both sides of the quilt. They are not fast or easy to make. Please note that there are limitations on a double-sided quilt that you won’t find on our singled-sided quilts. The double-sided order form is at the bottom of this page. Here's what you need to know about having a double-sided quilt made from your T-shirts. You will need to double the number used on a single-sided quilt. Here is a link to the How Many T-shirts page for single-sided quilts. Unlike our single-sided quilts, none of the images on the T-shirts will be traced. Read more about how we quilt our regular quilts here. At this time, we are not offering borders on double-sided quilts because of the complexity they add to the project. 3D items such as bows, stuffed animals, varsity letters, patches and anything else that is not flat will not be added to the double-sided quilt. We do not make double-sided baby clothes quilts. The front and the back of your quilt have to be and will be the same size. There are a number of different ways you can divide up your T-shirts. You would send us one grouping of T-shirts and we would divide the T-shirts between the front and back based on content and color. You can divide your T-shirts into two separate bags – one for the front and one for the back. You will need to be willing to move T-shirts from one side to the other to balance the size. You need to have these shirt(s) determined ahead of time so you can tell us which ones to move without us having to go through each block with you. You will need to have a bag of extra T-shirts that can be used to balance out the smaller side with the larger side. You can have us add blank blocks of T-shirt material to the small side to increase its size to be equal with the other side. You can send us T-shirts and have us use the fronts on the front and backs on the back of the quilt. This method will most likely result in the front and back of the quilt being different sizes. This means you will need to have a plan to balance out the two sides. See a, b and c above for options. We can put the fronts of your T-shirts on the front of your quilt and the backs on the back. But we will not attempt to match up every front to it’s back so they are front to back on the quilt. This is because the fronts and backs of T-shirts are rarely the same size and matching becomes unmanageable. Double-sided quilts are being made at the Charlotte, Michigan and Austin, Texas locations. If you live in Texas, Arkansas, Oklahoma or Louisiana, here's the order form for you to use - Double-sided Order Form Austin, TX. 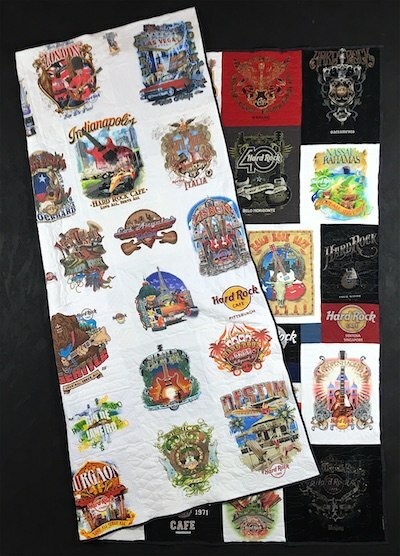 If you send your T-shirts to another one of our locations requesting a double-sided quilt, you will be responsible for additional shipping cost to have your T-shirts sent to Michigan or Texas.